"The Secretary of State for Education has approved the establishment of an Interim Executive Board for Sedgehill School." This is the news we've all been anxious for. We've all fought hard and campaigned for our school and our community values. We've done a great job. We've gained over 2,000 likes on this Facebook page and even more combined signatures on our various petitions. We've shown the misinformed heads at the top of the council what democracy in action looks like and just how mighty our lion's roar can be if we all roar together. 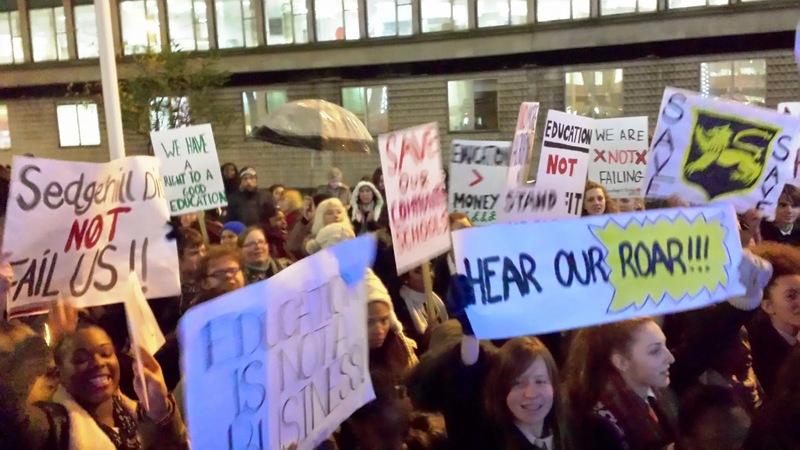 On Friday, Lewisham Council announced in a statement on their website that the Secretary of State for Education, Nicky Morgan, has approved the establishment of an Interim Executive Board for Sedgehill School. This is the board of appointees of the council's choosing which will very soon forcibly replace the governing body of our community school, with many of the replaced governors being democratically elected into their positions. While this is hardly the outcome we were fighting for, the goal of keeping Sedgehill the inclusive, welcoming, nurturing and constantly improving community school that it is has not changed. Nevertheless, we hope that we can continue our studies as students and our parents and the local community can continue to interact in the same uniquely great way as ever and we hope that our as exceptional staff as possible will continue teaching and taking care of Sedgehill to stay true to this goal. Our goal is now to ensure that the IEB will work towards the common goals and aspirations of this genuine community school, its students, parents, staff and community and carry on the great work they've all done so far. We will vehemently oppose any attempts to impose plans which will damage the education of students or the unique sense of community at Sedgehill School. Interesting to note that your daughter is amongst the list of 'represented' students. Such a narrow-minded blog, full of self-importance, with no understanding of education today, just riddle with 1970's dogma....you are a joke Martin! !